For those of you who don’t know what Lead Pages are, they are the service that makes pretty pop up boxes, lets you automatically send out digital products and makes your landing pages look nice. LeadPages are used by most, if not all, of the top marketing people that I know and most of the big names in coaching, authoring and speaking too! Now, there are plenty of reasons to use the regular box just as it comes. They have found that having the progress bar at the top makes a loop in people’s heads that they want to finish. They have found that the arrow drives people to fill out the boxes and if you are all, “I don’t care what it looks like, just get ‘er done” then why are you reading this post? 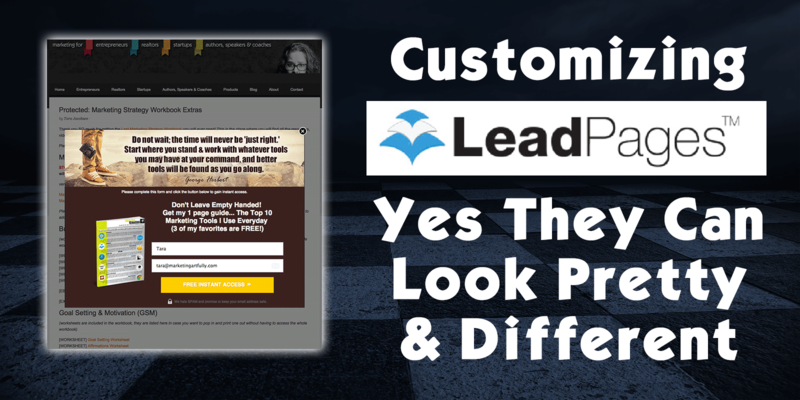 This post is to show you that there are ways to change the look and feel of your Lead Pages so yours look different. 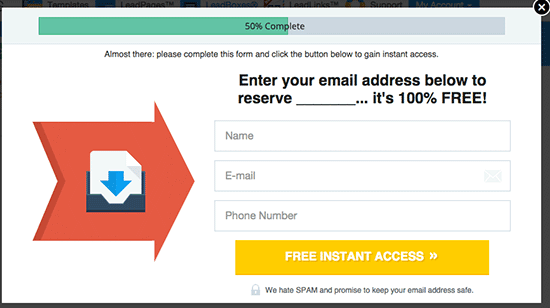 So that you don’t have the same old “me too” popup box or landing page form as everyone else. Seriously, it takes just as much time to make a pretty form that people will notice as it does to use the same old icky “normal” form. 1. What is the “normal” look for your site? I never use white and plain graphics so the “normal” popup box is a glaring difference. When I added graphics to my popup boxes I started to see a big difference in signups. I think it is because they look more like my site. 2. Even if you just using a little different look, it will make you stand out from all the other people who are using Lead Pages. 3. Don’t forget that you can split test different graphics from right inside LeadPages! 4. Getting graphics designed is not hard anymore, you can even get them as cheap as $5 on Fiverr.com. Just make sure that whatever they use for your images is purchased just for your right or you could be fined up to $600 for each “borrowed” image. 5. 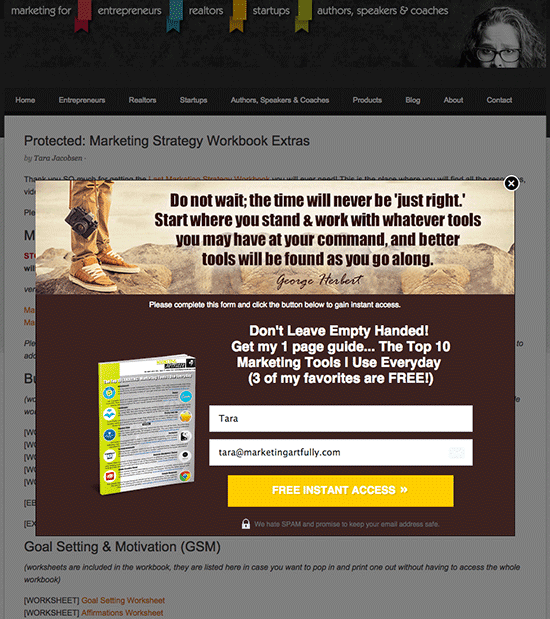 If you would like some more examples, please check out my LeadPages Pinterest board where I collect different people’s popups, landing pages, etc. Alrighty then, there is a peek behind the scenes of how I customize my LeadPages to make them pretty and different from all the other “me toos” out there in the marketplace! If you have any questions, please feel free to shoot me an email at tara (at) marketingartfully.com or if you are ready to sign up for LeadPages click here! Previous Post: « Social Media Marketing – I Don’t Care If I Get Likes!